Uncontrolled air leakage through the building envelope will affect the performance of the building materials within the wall assembly. You’ve made a major investment in your facilities and that investment deserves the very best protection available. That very best protection is offered by the AIR-SHIELD line of air barriers from W. R. MEADOWS. The AIR-SHIELD line includes fluid-applied air barriers, sheet membranes, and vapor-permeable formulations. 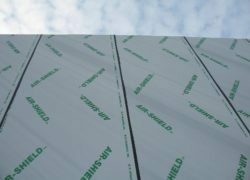 AIR-SHIELD ALUMINUM SHEET MEMBRANE self-adhering air/vapor and liquid moisture barrier is the newest addition to the wide line of air barrier technology available from W. R. MEADOWS. It is a sheet-applied membrane that is nominally 40 mils thick. The membrane’s controlled thickness is fabricated from aluminum bonded to specially modified asphalt. Primary applications for AIR-SHIELD ALUMINUM SHEET MEMBRANE include cavity wall and masonry wall construction. 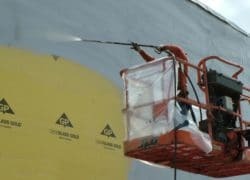 The product works equally well as an air and/or vapor barrier on precast concrete, cast-in-place concrete, masonry (concrete block), interior and exterior gypsum board, Styrofoam, primed steel, aluminum mill finish, anodized aluminum, primed galvanized metal, drywall, and plywood. A key feature of the product is its low permeability, which prevents the transmission of air and inhibits moisture vapor through porous building materials. For over 90 years, W. R. MEADOWS has been recognized as the leader in developing and producing quality products for the construction industry. We have built a coveted reputation among architects, engineers and contractors for producing the highest quality products backed by 90+ years of experience. Remember, air barriers are required in all new federal construction. Choose W. R. MEADOWS air barrier systems – we have the right product for your application requirements. How does air move through my building? Air will move through the building if there is a pressure difference across the building envelope. As a result, any hole or penetration in the building envelope can allow moisture-laden air to move through the wall. So how do we prevent air movement? AIR-SHIELD air/liquid moisture barrier from W. R. MEADOWS is available in six different versions, based on what your building needs entail. AIR-SHIELD LM is a liquid applied, water-based, polymermodified air/vapor and liquid moisture barrier. AIR-SHIELD LM cures to form a tough, seamless, elastomeric membrane, which exhibits excellent resistance to air and moisture transmission. AIR-SHIELD LM (ALL SEASON) is also a single component, liquid applied, polymer-modified air/vapor and liquid moisture barrier, but unlike AIR-SHIELD LM, it can be applied at temperatures as low as 10º F (-12º C) . AIR-SHIELD LM (ALL SEASON) still maintains its low permeability and excellent adhesion, even in low temperatures. AIR-SHIELD LMP is also a single component, liquid applied, vapor permeable air/liquid moisture barrier. AIR-SHIELD LMP stops the movement of air, while at the same time, allowing the passage of vapor. The product is designed for wall assemblies that need a vapor permeable air barrier. AIR-SHIELD LSR (liquid synthetic rubber) is an asphalt-free, single-component, synthetic rubber based liquid air/vapor and liquid moisture barrier. AIR-SHIELD LSR cures to form a tough, seamless, elastomeric membrane, which exhibits excellent resistance to air and moisture transmission. AIR-SHIELD LSR has been specifically formulated to act as an air/vapor and liquid moisture barrier within the building envelope. It may be applied to most common surfaces and integrated into various wall systems. AIR-SHIELD LSR is suitable for both new construction and restoration. AIR-SHIELD THRU-WALL FLASHING is a self-adhering, flexible membrane flashing. It is a roll-type product that is nominally 40 mils thick. This material is an air, vapor and liquid moisture barrier. AIR-SHIELD THRU-WALL FLASHING is a concealed flashing for masonry concrete, wood/steel frames and roofing applications – door and window lintels, sills, spandrel beams, caps and parapets. AIR-SHIELD THRU-WALL FLASHING is designed for use as a thru-wall flashing and dampproofing course. Drawings are for illustration purposes only and may not be suitable for use in all climate zones. Our AIR-SHIELD accessory products are designed and developed to work together to complete a total air barrier system. You can make a difference!Developed to be used as a complete air and air vapor barrier system, the components, whether liquid or sheet, are designed to work together to help make your building more energy efficient and combat indoor air quality issues. By controlling excessive air flow from your building, you can have a direct impact on our environment. A properly designed air barrier system will reduce the use of energy, which in turn reduces fossil fuel consumption and thus reduces the greenhouse effect.